Ever say something that sounds really wise and feel pretty good about yourself and then later you realize that you're not as smart as you thought? The other day I was meeting with a worry-wort. I mean the kind of person who worries about EVERYTHING. Her whole life, mind, and body are wracked with the stress and anxiety of wayward kids, shiesty exes, unfriendly co-workers, what to eat, how much diet soda she drinks, what her boss thinks of her, etc. I was in the middle of a small family crisis when I was meeting with her in the late afternoon last week and my cell phone kept going off. I finally turned it off. "You can get it if you want," she offered. I could tell by her face that she was already adding me to her worry list. "Oh no, that's fine. It's no big deal." I put my phone on the chair next to me so it was out of sight. "No, really go ahead. Aren't you going to worry?" She couldn't believe I wasn't going to at least listen to my voice mail. "I don't worry about things I can't control." She looked me in the eyes for a second, digested the line and then got a look of zen on her face. "That is a good one. 'I don't worry about things I can't control.' I wish I could do that." 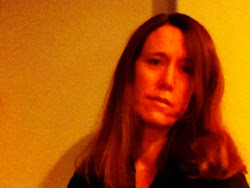 She smiled meekly and looked at me in admiration. I felt like Oprah. Here I was in this tiny room, my phone blowing up with calls and texts, a little number '3' next to the voice mail icon on my phone, and I wasn't going to worry about things I couldn't control. Isn't that great? Then I felt even better when I remembered that I was actually following one of Stephen Covey's Seven Habits of Highly Successful People. (Get the 7 Habits Here) I couldn't remember which one of the seven I was following (Put First Things First? ), but I remember that there is this really neat diagram in the book about the "Circle of Concern" and "Circle of Influence." Basically Covey says you should only focus time and effort on what is in your "Circle of Influence" and it is successful people who don't let the "Circle of Concern" (i.e. stuff you can't control) bog them down. Look at me! I was doing that! I was only worrying about what I could control! I could be a Covey Consultant! Then God smacked my ego right upside its face. "I don't worry about things I can't control, huh? 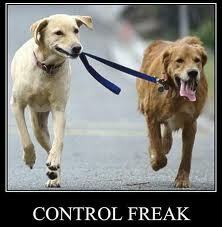 Easy for you to say, Control Freak!" I was driving home from work when the second part popped into my head. I'll admit I laughed. Why? Because it is true and God is good to keep me from getting so proud of myself that I spew Covey and Oprah "words of wisdom" around like I am someone who has it all together. Look, I may not be like my worry-wort friend, but that doesn't mean I handle worry wisely. It is easy for me to say that I don't worry about what I can't control if I try to take control of MOST OF MY LIFE. There is a reason I am called "Hands-On Horner" by a few who know me well. I like to conduct, direct, organize, inform, lead, show, tell....CONTROL. Not in a freaky, overbearing, psycho rabbit-boiling-on-the-stove kind of way, but in a way that can be a little unbalanced sometimes. My control issues mean I sit on the aisle in movie theaters, church pews and on planes if possible. It means I can't relax if my living room is messy. I plan every day, even weekends. The Container Store is like Disneyland to me. I keep all my "TO-DO" items front and center on a list in the kitchen and I run errands around town in a methodical fashion - starting with the place farthest away and working my way back. Spontaneity is not in my vocabulary. I eat on a schedule and could eat cereal every meal for the rest of my life and not get bored. I like to suggest to others how to better organize their own lives. I am often early, never late. I am organized, driven and responsible. I am also cynical. Proud. Sarcastic. Critical. You can be worry free if you think your way is the best way and everyone else has got it all wrong. You can be worry free if you are drunk. You can be worry free if you don't really care what happens to others. 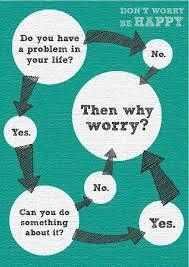 You can be worry free if you are apathetic and shirk all your responsibilities. You can be worry free if you are lazy. You can be worry free if you choose to make no commitments, have no deep relationships, live for yourself. All of the above can make life (or at least a few hours of it) worry-free, but it is it healthy? Does it mean I have my worry under control? Does it mean I get to gloat like Dr. Phil over my worry-stricken friends? And that is why I think I was humbled the other day after delivering my little line about not worrying about what I can't control. It was like God said later, "Nice one Princess Platitude. Now stop being so proud and pray." I was immediately reminded of Matthew 6:34 which is one of those really easy to understand and practical Bible verses that I just love. It says, "Don't worry about tomorrow. Today has enough trouble of it's own." Ain't that the truth? Not because I think the whole world is in my hands. Feel free to comment, forward, tweet and post on Facebook! Thank you.